We can't get enough of the Baltimore craft scene these days. It's quickly turning itself into a veritable treasure trove of highly accessible and extremely tasty brews. We stumbled into the guys at Full Tilt on our way through Baltimore a few months ago, and these guys aren't messing around. They are determined to be a craft landmark in the near future, and we think there is some serious potential there. This is Nick Fertig and Dan Baumiller. They started Full Tilt. We got a chance to speak with Dan about their new brewery. Hey Dan. What’s your story. Hey man. Thanks for the time today. Back in 2008, my partner Nick and I started homebrewing – He was a nuclear engineer on a submarine, and I was in acquisitions, both for Navy. We did a lot of research and found a guy who contract brewed out of Heavy Seas. We reached out to him and had a conversation about starting a brewing facility. It looked like an alternation proprietorship at first, but eventually it turned out to be a contract brewing relationship, which isn’t quite what we were envisioning when we got started. We brewed our first batch Dec ’12, and it launched January 2013. Both of us still have full time jobs, aside from managing a brewery and developing recipes in our garage. We take our recipes to our master brewer (Peabody Heights brewery), who we share with Raven Brewing, and they make the beer. Their master brewer has to adjust our recipes up to scale. But we are on the hunt for our own facility. So how does that affect your distribution? We started Maryland-wide from Day 1. We didn’t start with a tiny facility like a lot of breweries. There are definitely some hiccups in doing it the way we are, and some larger issues have popped up, but the dream is still there for us. Baltimore knows our beer already. People want good beer and we are apart of the conversation in our local community. How do you keep up the enthusiasm? We have been in love with craft beer for a long time. You develop an obsession with building something (I do anyway). I’ve got a serious entrepreneurial spirit, and we both had a dream of starting a company together. When we started brewing, we brewed one batch of beer a week for a year. Oktoberfest at Nick’s house in the Canton neighborhood of Baltimore was always the best. Our imperial pumpkin beers we made were always popular at these parties. We loved doing it. You could definitely say that we had a lot of drunk friends that year. About two years into it, we graduated to the system we have now. Homebrewing was always a means to an end...to eventually get us to a point where we could do this professionally, and when we realized this was going to be a business, we had to decide how we wanted to start brewing. One of our first decisions was deciding on a flagship beer. We love hoppy pale ales, so we decided to make a flagship pale ale. What are you thoughts on having a flagship beer? We might figure something out to move away from the “flagship” beer idea, but all of our decisions would need to be sales-driven. We’ve come out with other beers, and the craft beer bars put us on a rotating roster of beers, but our flagship styles are good sellers. 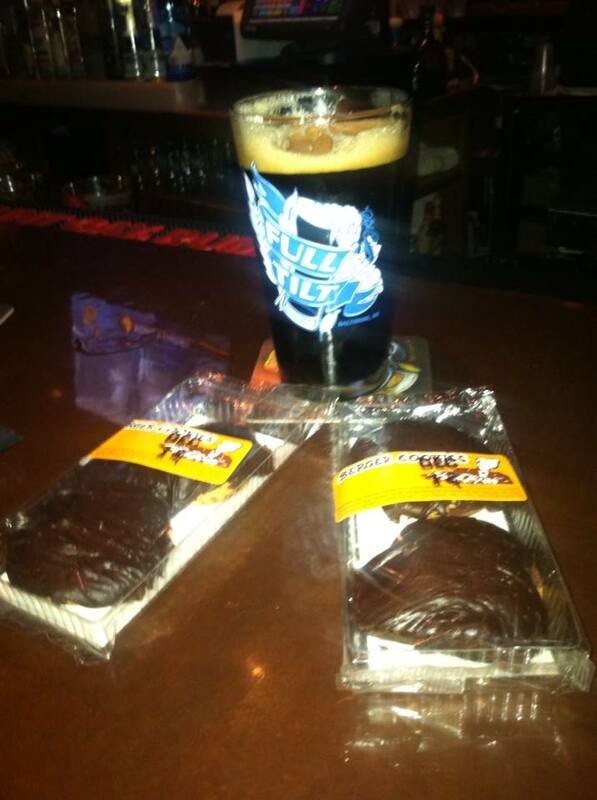 The beer that got us the most attention is the Berger cookie chocolate stout (editors note - it’s a shortbread cookie made in Baltimore – covered in rich fudge). Nick and I’s parents are all from Baltimore. Berger cookies were at family gatherings all the time. He told me it would be awesome to make a “Berger cookie” chocolate stout. Nick had a great chocolate stout recipe. He reached out to the company about it. It was an extremely difficult beer to design, incorporating the raw ingredients of a fudge cookie into a beer, and the bakery wouldn’t have it any other way than us using their ingredients. We did a lot of recipes before we got it right, but I think we nailed it. It was a play off of some nicknames for Nick. Fult Tilt Fertig. It was our mantra. We didn’t do anything halfway. 100% effort on everything. Put the pedal to the metal on everything you did. Fair enough. How’s the Baltimore craft scene? It’s moving in the direction of becoming a big craft beer town. A lot of young, educated people drinking craft beer and wanting more local variety. It’s not the same as New England, or out West, but it’s growing just like it’s growing everywhere else in the U.S.
Nick and I come together and decide what kind of beer we want to make. We did the pale ale, the raspberry wheat, the Patterson pumpkin, and the Berger cookie stout based on what sounded good. We even had one called Camden cream. How do you make a beer people like? You just gotta hang it out there man. Have your friends try it. Tell folks. Ask around. But at the end of the day, you can only do so much research before you make a beer. The Fully Tilted BPA we made is a great example of just going for it without test batches. It’s not a huge leap to double up on a recipe that we’ve already been making and age it on oak, we just hope everyone likes it. What are you drinking now that isn’t your beer? Everything. But I’ve been really getting into the Session IPAs recently. Some of my favortites have been Stone, Lagunitas, and Flying Dog’s versions of that style. Thanks Dan. Best of luck moving forward! And go drink their beer. It's really good.